Clip2Net is an impressive application that lets you easily upload photos, files, and folders to the web directly from your desktop. 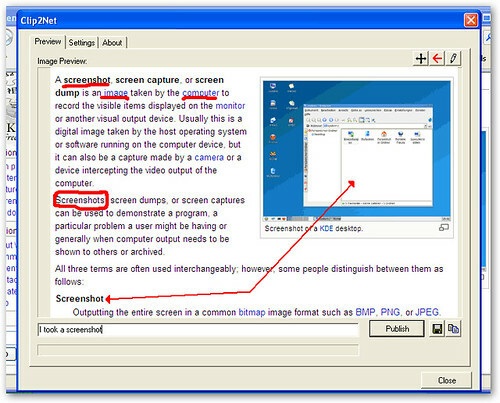 You can create screenshots of your desktop, upload them directly to the web, and get back HTML code for easy posting online. Similarly, you can drag-and-drop files and folders for quick uploads to Clip2Net and get back a download link to a ZIP file of those uploads. The addition of screenshot sharing makes Clip2Net a little different and more versatile than the usual uploader for a file sharing site, which might make Clip2Net "the easiest way to web publishing". Clip2Net works on Windows 2000, XP, and Vista.